A model by MIT researchers can guide the design of solar cells that produce less waste heat and more useful current; Yale researchers have developed a simple method to control the “doping” of carbon nanotubes that could improve their utility in apps including CNT-silicon hybrid solar energy cells. When sunlight shines on today’s solar cells, much of the incoming energy is given off as waste heat rather than electrical current but in a few materials, extra energy produces extra electrons. According to researchers at MIT, this behavior could significantly increase solar-cell efficiency. The team has identified the mechanism by which the phenomenon happens, which has resulted in design guidelines for using those special materials to make high-efficiency solar cells. In most photovoltaic (PV) materials, a photon delivers energy that excites a molecule, causing it to release one electron but when high-energy photons provide more than enough energy, the molecule still releases just one electron — plus waste heat. However, a few organic molecules don’t follow that rule and instead generate more than one electron per high-energy photon in a phenomenon known as singlet exciton fission. 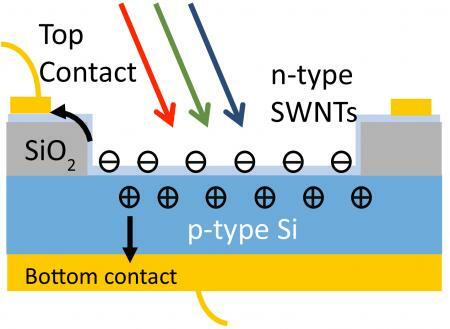 Achieving this in a functioning solar cell has proved difficult, and the exact mechanism involved has become the subject of intense controversy in the field. For the past four years, the MIT researchers have been pooling their theoretical and experimental expertise to investigate this problem. Last year they reported making the first solar cell that gives off extra electrons from high-energy visible light, which makes up almost half the sun’s electromagnetic radiation at the Earth’s surface. According to their estimates, applying their technology as an inexpensive coating on silicon solar cells could increase efficiency by as much as 25 percent. While encouraging, understanding the mechanism at work would enable them and others to do even better. Exciton fission has been observed in a variety of materials, all discovered by chance but materials and devices that take advantage of exciton fission can’t be rationally designed until the fundamental mechanism at work is understood. The new first-principles formula successfully predicts the fission rate in materials with vastly different structures. In addition, it confirms once and for all that the mechanism is the “classic” one proposed in 1960s: When excess energy is available in these materials, an electron in an excited molecule swaps places with an electron in an unexcited molecule nearby, according to the team at MIT. The excited electron brings some energy along and leaves some behind, so that both molecules give off electrons. The result: one photon in, two electrons out. The simple theory proposed decades ago turns out to explain the behavior, while the controversial, or ‘exotic,’ mechanisms proposed more recently aren’t required to explain what’s being observed. Yale University researchers have developed a simple method to control the “doping” of carbon nanotubes (CNTs), a chemical process that optimizes their properties that could improve the utility of doped CNTs in nanotechnology and flexible electronics applications including CNT-silicon hybrid solar cells. The method uses organic compounds with a metal core—known as metallocenes—to produce two possible types of doped CNTs. A small amount of metallocenes in solution is deposited on the CNTs, which are then rotated at high speed. This simple “spin coating” process spreads the solution evenly across the surface of the CNTs, resulting in high doping levels that can improve electrical utility. Using the method, the researchers found that doping with electron-deficient metallocenes, such as those with a cobalt core, results in CNTs with more positively charged electron “holes” than available negatively charged electrons to fill those holes; these CNTs are known as “p-type” because of their positive charge. On the other hand, doping with electron-rich metallocenes, such as those with a vanadium core, results in thenegatively charged “n-type” CNTs, which have more electrons than holes. According to the team, metallocenes are the first generic family of molecules demonstrated to produce both p-type and n-type doping and they showed that by changing the coordinate metal of a metallocene, they could render these carbon nanotubes p-type or n-type at will, and can even go back and forth between the two. The finding is significant because although p-type doping is common and even occurs naturally when CNTs interact with air, previous n-type doping methods produced low doping levels that could not be effectively used in devices. The Yale team’s method produced an n-type CNT-silicon cell more than 450 times more efficient than the best solar cells of this type.